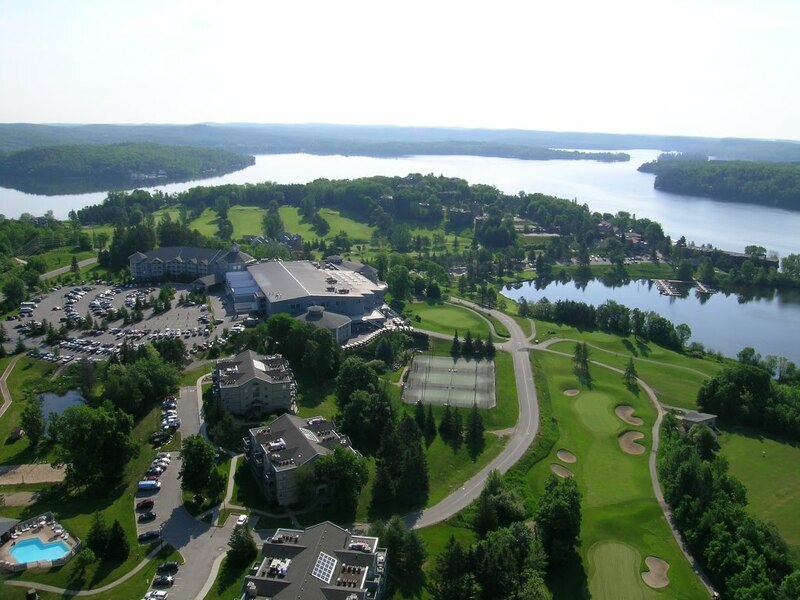 The race site: Deerhurst Resort. Beautiful Muskoka, Ontario. An Ironman 70.3 is exactly half the distance of a full Ironman: 1900m swim, 90km bike (94km at Muskoka!) and a 21.1k run. So before I arrived here, I figured this would be a lot like the other half Ironman triathlons out there. What's the difference, other than the fact that it cost me twice as much? For one, as you walk around you see big triathlon stars like Craig Alexander wandering around with his bike. Lisa Bentley is one of the organizers, she's here too. And there's clearly a lot of out-of-province and out-of-country competitors you just don't get at the other triathlons. Prize money and Championship spots are on the line, so the big guns show up. Most of the athletes are staying on-site, rather than driving up the morning of the race. It has an "athlete's village" feel to it, fancy bikes and skinny people in lycra as far as the eye can see. It's the first time in a long time that I feel like the fat guy! There is just a vibe here that is very exciting - not quite Ironman, so let's call it an Ironman-lite feeling. 1900m swim in a nice peaceful lake, followed by 94km of torture on the bike and 21.1km of torture on the run. It's not the distances that inflict the torture, it's the terrain. It is crazy hilly here. There are no big mountain passes, just relentless hills that you're either going up or down the entire race. Some are rollers, some are long climbs that take several minutes to get up, but it all adds up to one heck of a challenge. I am not really ready for a 1900m swim... I have not been in the pool much this year, so it's going to just be a matter of surviving the swim and then trying to make up ground the rest of the race. You don't lose a lot of time with a bad swim - maybe 5 or 10 minutes over a race that will take me around 6 hours. But a bad swim leaves me panting and in bad shape for the bike, as I found out at the last race! So I am going to try my best to control my effort and stay as fresh as I can, even at the expense of a few minutes. Overall I would like to be in that 6 hour ballpark. Under 6 would be fantastic, slightly over would be OK too. I'm excited to see how well I can run tomorrow, conditions should be cooler (possibly wet) and that should make a real difference for me. The course is killer. The rollers never stop. Keep yourself smooth on the swim and under control on the bike, then survive the run. Hopefully the rain holds off.